The Companion to Ancient Israel offers an unparalleled exploration of the political, social and cultural world of ancient Israel. 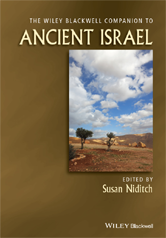 Methodologically sophisticated, it provides an overview of ancient Israelite culture, richly informed by a variety of approaches and fields. These include the history of religion with its interests in worldviews, symbol systems, paradigms, and the benefits of comparative, cross-cultural study; the study of religion as lived, an approach that examines the everyday lives of ordinary people and the material cultures that they construct and experience; and cultural studies with its interdisciplinary emphases and methodological questions about the academic assumptions that scholars make. New Historicism to the Rescue?